Dr. Sanjay Srivastava | HOPE Global Forums | Presented by Operation HOPE, Inc.
Dr. Sanjay Srivastava is the Associate Dean for Strategy and Special Projects at the J. Mack Robinson College of Business, Georgia State University. From 2002 to 2013, Dr. Srivastava was a Director of Sovereign Debt Solutions, a company specializing in restructuring distressed sovereign debt. From 2004 to 2006, he was Kenneth Black Jr. Chairman of the Department of Risk Management and Insurance at Georgia State University. 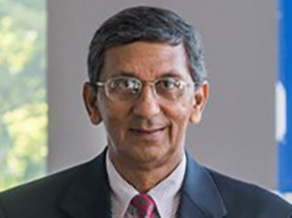 Dr. Srivastava served on the faculty at the Tepper School of Business at Carnegie Mellon University until 2004, where he was the Alumni Chair Professor of Economics and Finance and also Associate Dean for Intellectual Strategy. He was one of the founders of the University’s Computational Finance program in 1994, which remains the premier program of its kind in the world. He served as the founding director of the program for its first five years, and then on its steering committee until 2004. With Professor John O’Brien, Dr. Srivastava created the FAST Lab, a laboratory for financial education and research, including the first educational trading room at a business school. The Smithsonian Institution’s Archive of American History has made the progressive work of the FAST Lab part of its permanent research collection on innovative information technology and awarded it a Computerworld-Smithsonian medal. Dr. Srivastava has also taught at the California Institute of Technology, ITESM in Mexico, and Aoyama Gakuin University in Japan. He has conducted executive education courses in the United States, England, Switzerland, and Australia. Professionally, Dr. Srivastava has served on the NASD Technology Advisory Committee, the Scientific Advisory Council of FAME (Switzerland), the Scientific Board of ITG Inc. He has worked as a consultant with Morgan Stanley and the J. P. Morgan Private Bank. Sovereign Debt Solutions was the entity that acted as the negotiating team for the Argentine Bond Restructuring Agency PLC (ABRA), a special purpose vehicle established for the sole function of aggregating bonds issued by Argentina and held by retail and small institutional investors outside the United States and representing those investors in the restructuring of Argentina’s sovereign debt. Its subsequent activities focused on the European debt crisis, including restructuring of banks. His role with SDS focused on computational and analytical tasks. He is a Partner at OS Financial Trading System (FTS), a company that creates trading simulation software and teaching materials for universities.